Artcoustic has selected it’s installation of the month for March. The simple installation was for Mango Vision in UK, who required a high-quality audio system for this clean and contemporary kitchen. The client requested exceptional television sound that could also deliver music with enough power and dynamics to entertain friends and family. The clean aesthetic of the room was important, so Diablo SLs were installed with great prints from the Artcoustic Portfolio, by Studio Parris Wakefield. A Panel Sub Micro was also installed for a really full bottom-end when music is playing. The Diablo SL is one of the most popular speakers in the Artcoustic range. The dimensions and design make it perfect for many applications, from a kitchen like this, to bedrooms and living rooms. The Diablo SL can be used wherever high-quality audio is required in a variety of multi-room applications. It is also used in living room ‘home cinema’ systems remaining discrete whilst delivering stunning quality. The Diablo SL has become an icon of the Artcoustic design ethos and models are on permanent display at the company’s UK showroom, where customers can request a demonstration. The Diablo is a flexible loudspeaker designed for use in smaller rooms, for home cinema or HiFi purpose, as well as being designed for multi-room applications in kitchens, bedrooms, studies etc. The speakers produce more bass than the smaller Target SL model. For more information about Artcoustic’s range of speakers for homes and smaller rooms, visit the company website. 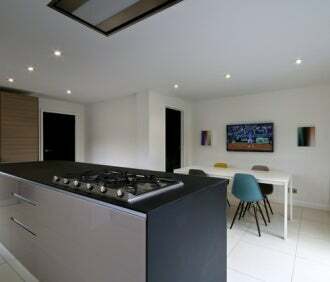 Image: Two Diablo SL speakers installed in a private kitchen. Photo: courtesy of Artcoustic.